Friday, March 27th at 10:30pm. Tickets are $5 at the door. 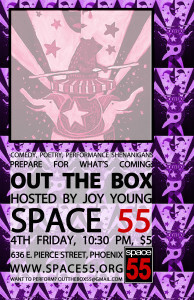 Out the Box is Space 55’s brand new, late night show hosted by Phoenix’s *only* queer circus-poet, Joy Young. With a focus on marginal voices – the LGBTQ community, women, people of color, and others – we’re seeking to create a safe stage that amplifies these voices while also providing room for up and coming artists. 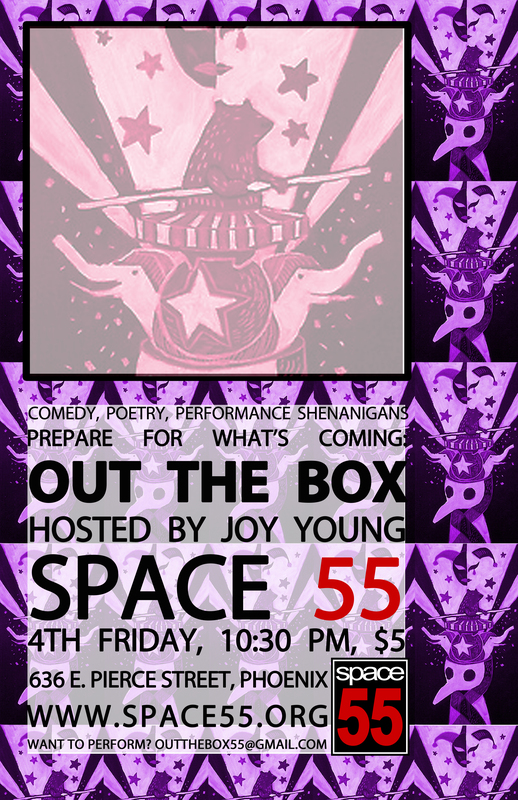 Join us for SPOKEN WORD, MUSIC, COMEDY AND OTHER SHENANIGANS as we strive to produce programming that celebrates our stories and supports a more sustainable, diverse arts community here in Phoenix.